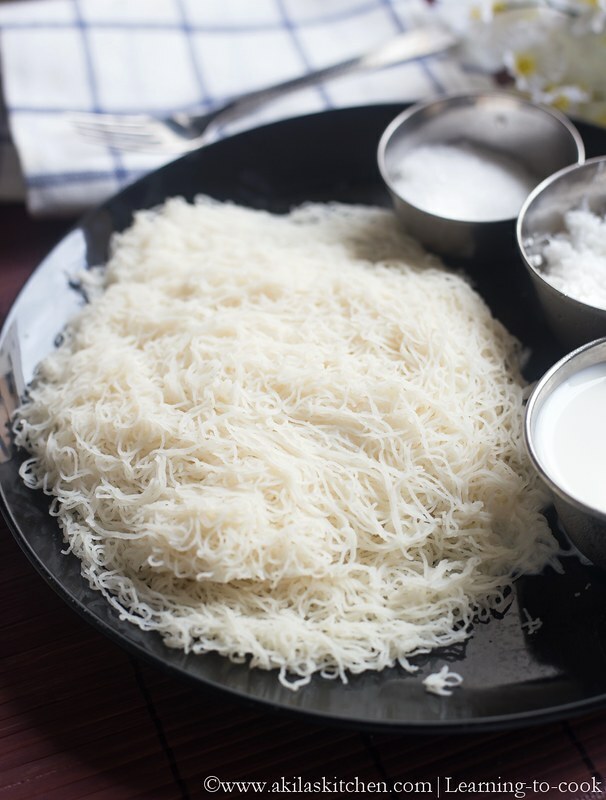 Idiyappam or String Hoppers is one of my favorite dish, But, In our house, we do not make this often, as my mom was also working, she never find time for it. But next to our house, one grandma, used to sell this. So my mom used to buy this from her. I do not know how they will make it, but it was the soft and yummy and tasty idiyappams I have ever tasted. After coming here, my hubby used to get the ready made idiyappams as I do not know how to make it. But I want to try this for myself so that I can have my own fresh idiyappams. So last december when I went India, I bought the Sevei press/Idiyappam maker (Called Sevai Nazhi) the one, which is used to make the idiyappams. My first experience in making idiyappams was really very tough. After 3rd idiyappam, I could not press the sevai at all. My hands were paining so much. I was thinking, why it is so hard to press, though I used to remove and clean the dough from the sevai each time. I actually called my hubby to press and give it for me. You know what happened, he too, could not press it, the dough has become so tight. Then my idiyappam flour, finally turned to kozhukattai. I lost my hope of making it. Three weeks later, I got store bought idiyappam flour and I wanted to give a try again. This time, instead of adding the full flour, I added 1/2 cup flour and added 1.5 cup water and water and started pressing idiyappams when the dough is still hot and to my surprise, it came out so easily. I was so happy. I repeated the same and I find this way to be very easy. I had it with kurma. So, for the beginners like me, you can follow this method. Ok, now lets go to the idiyappam recipe. 1. In a bowl add the rice flour, salt, oil and add the boiling water little by little and start mixing it so that the flour gets cooked and comes to a pliable dough. 3. Now grease the idiyappam plates with little oil and press the idiyappam maker slowly in circular motion. 4. 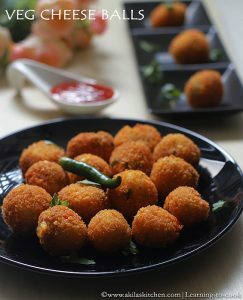 Now keep the plates inside the idiyappam cooker or idli cooker and steam cook the plates as you cook for making idli’s. After 8 to 10 minutes, reduce the flame and slight touch your idiyappam to check if it is cooked (The dough should not stick in your fingers). 5. Tasty idiyappam is ready. If using Idiyappam flour, check for the salt first. If you really need the salt, then add it. 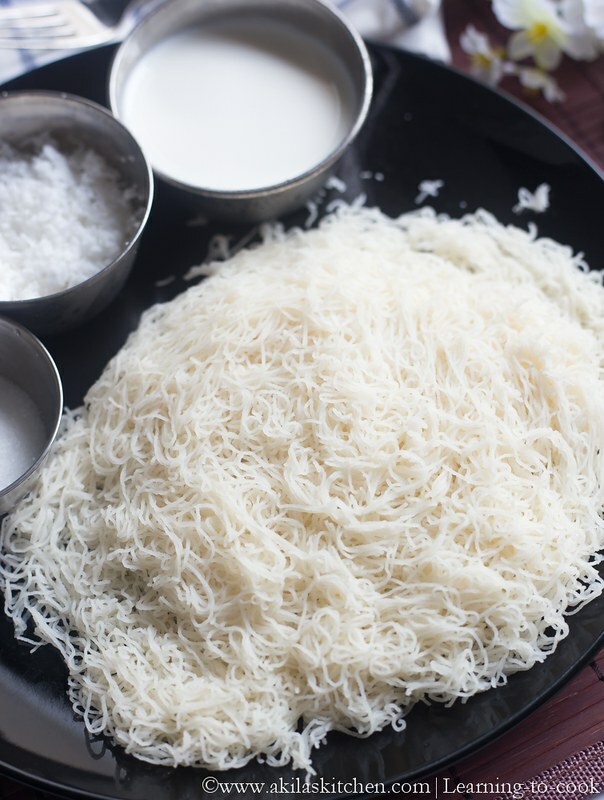 Before steam cooking, you can sprinkle the grated coconut, sugar and little cardamon powder, to make the idiyappams more flavor. As my family members, like to have it with kurma, I did it with potato kurma normally. You can also use the idli plates or the plate which contains holes, so that, the idiyappams can be steam cooked. yummy, looks super soft and perfect combo! Love to finish that whole plate rite now,irresistible and seriously tempting. A lovely breakfast!! Looks delicious! I'm too lazy that I always buy these ready made ones which you can microwave in minutes. But I must say home made is anytime a show stopper. yummy idiyappams and delicious kuruma to go with it. 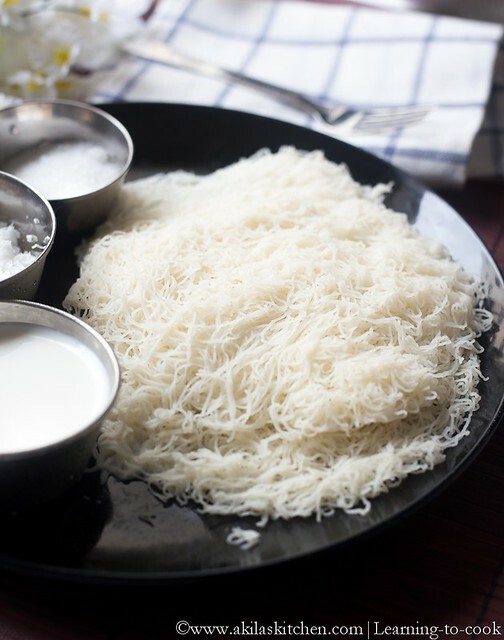 looks very tempting & delicious idiyappam!! Am always prefer idiyappam & coco milk,never tried with kurma,looks yummm!! looks delicious, i've never seen anything like this. for a second I thought it was idli. yum! Lovely looking hoppers.. U can buy the new variety of stainless steel idiyappam maker.. U can easily use them with very less effort..
i am craving for it now.super presentaion.yummy clicks.